This extension helps you control more of your web activity from Facebook by isolating your identity into a separate container. This makes it harder for Facebook to track your activity on other websites via third-party cookies. Amid Facebook Scandal, Firefox Shields Users From Data SharingUp until recently, most of the general public had never heard of Cambridge Analytica. That's no longer the case after a whistleblower revealed the firm's insatiable hunger for data on Facebook users -- and what Cambridge Analytica did with that data. It's been reported that CA stealthily harvested detailed information on more than 50 million Facebook users. 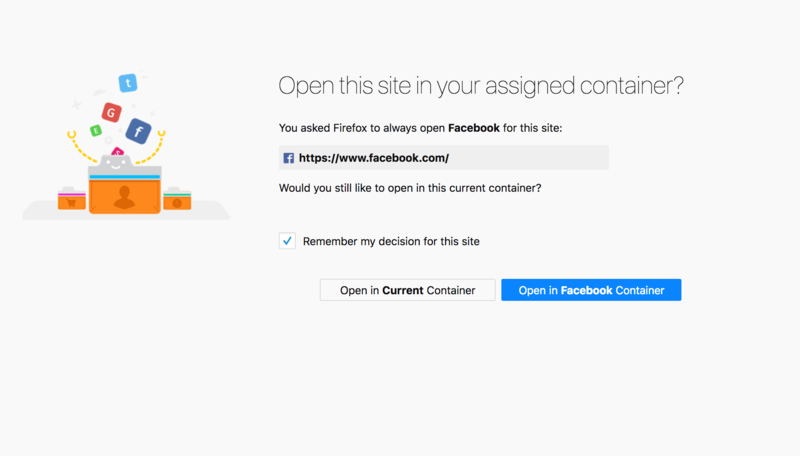 Mozilla launches Facebook Container add-on to isolate your web browsing activity from FacebookMozilla was the first major brand to announce it was "pausing" its advertising on Facebook in the wake of the Cambridge Analytica data privacy scandal. Today, the organization announced a new tool it said will help prevent Facebook from tracking your web browsing across the web. Mozilla's new extension keeps your Facebook data isolated to the social network itselfMozilla this morning launched a browser add-on for those users not willing to delete their Facebook account, but also wanting some control over how much of their data Facebook can access. The " Facebook Container," as the new extension is called, isolates your Facebook identity from the rest of the web. Firefox now isolates Facebook tracking so you don't have to delete itMozilla is capitalizing on the recent fears over Facebook privacy and data by creating a new Firefox extension that stops Facebook from tracking your online habits. The new " Facebook Container " creates a blue-colored browser tab that isolates your Facebook session from the rest of your web activity. Facebook Container Extension: Take control of how you're being tracked - The Firefox FrontierOur Multi-Account Containers extension has been a game changer for many users, letting them manage various parts of their online life without intermingling your accounts. To help Firefox users have more control of their data on Facebook, we've created the Facebook Container Extension. Would you recommend Mozilla Facebook Container to a friend? Adding a sandboxed container for a single website is a temporary fix to an ethical and legal problem whilst the technical solution has been provided to developers and professional users in the form of Ghost Browser 2. For Firefox users, this is a good start; it has worked well on my Firefox test rig. I have been using Ghost Browser since it was launched on Product Hunt and Ghost Browser 2 since it was made available for beta testing. The containerisation of the sessions and tasks in Ghost Browser 2 will not be fully replicated in any mainstream browsers but a few containers should be included in every browser for social media services until and possibly after legislation updates occur. MaX Falstein has used this product for one day. Alec Dewitz has used this product for one day. @ayush_chandra I was just about to ask the same question... Safari, too. Deleting FB isn't an option for globe trotting immigrants like me with family spread out across the world. I would love sth like this on all my browsers. @ayush_chandra @abadesi I too cannot delete Facebook completely ( although I removed the app from my phone ), because most of my logins use Facebook. @ayush_chandra @max_reborn Chrome extension was removed? How do I know the container is working? @akdm_ I don't think so. I think that add-on just sandboxes the account without blocking the cookies. This container is something like Incognito, it isolates facebook from anything else you do on the web. @tsoulichakib That's almost the same thing then. 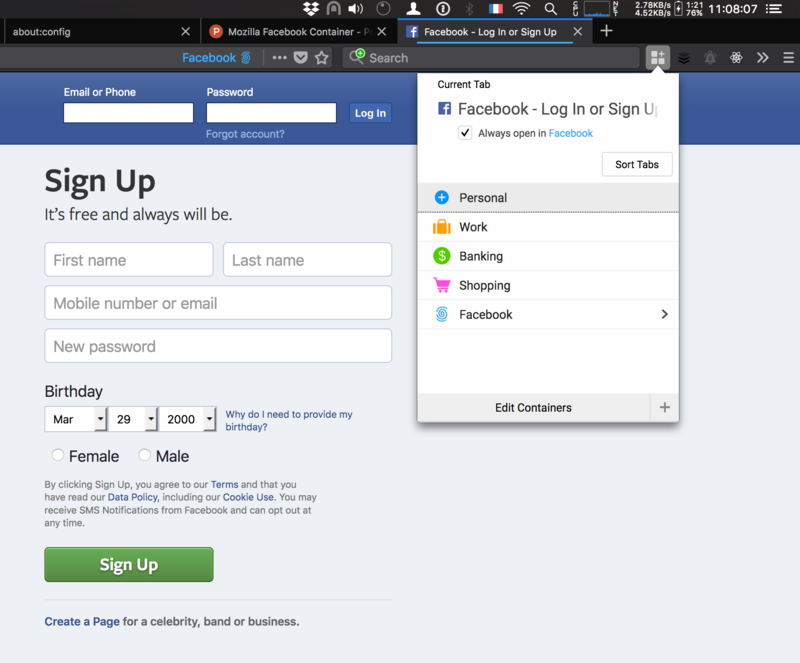 I use it and when I open two different containers on Facebook, I can login into my personal and work account separately. But if I go to another website within one of the containers, ads and other stuff can be retrieved from/by Facebook. But I think I can make some rules to prevent this, not sure. @tsoulichakib @akdm_ they are not the same. This container is a completely isolated sandbox for Facebook to run in. @tsoulichakib @maxfalstein That's the same thing if you tell the plugin to make Facebook.com by default to a specific container: You just have to create a container named "Facebook" (or whatever), and thick "Always open in Facebook": Then when you open a new tab and type Facebook.com in the url bar for the first time after installing the Container plugin, you will have the following: You must do the same with Mesenger.com if you use it, too. However (and I don't know how it works with the "Facebook Container" plugin), when you click on a external link from Facebook, it will still be in the "Facebook" container. I assume they then will be able to track you because of this. @tsoulichakib @akdm_ in your second comment, you stated "if I go to another website within one of the containers, ads and other stuff can be retrieved from/by Facebook" which is correct for the plugin you linked. This sandbox container only works for Facebook. Nothing can interact with the Facebook container, only Facebook services. Great. Best part is that Social Sign In also works like a charm.